Ota City Artists brings paintings, drawings and prints by artists in Greater Lafayette's Sister City of Ota City, Japan to Purdue and the Lafayette area. 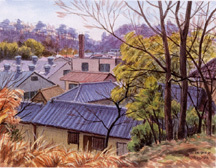 Many of the works represent views of the artists' local environs and provide us with a unique glimpse of their lives and culture. The exhibit was arranged to complete a cultural exchange that began with the "Tea Bowl" show presented by the Art Museum of Greater Lafayette in 1999 and sent to Ota City to be exhibited there. Purdue Galleries is working with our friends at the Art Museum, the Greater Lafayette Sister City group and Subaru-Isuzu to present these wonderful works.